Tanner Smith, a 2006 member of Capital Regiment, sent this picture. This is a picture of the Stephen F. Austin High School (Sugar Land, Texas) brass line members of Capital Regiment. We got together at the end of our Semifinals performance at the DCI World Championships and took this picture. Next season we will be splitting up into five different corps. We hope to unite again and take a picture at the end of the 2007 season with all of us in our different uniforms. 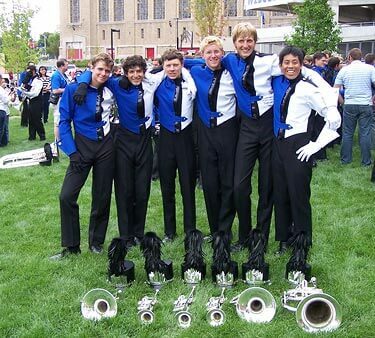 Left to right: Greg Muth (mellophone), Andrew Martinez (trumpet), Nathan Coppinger (trumpet), Tanner Smith (trumpet), Aaron Powell (mellophone), and Russell Zavalla (euphonium).